When finally the rain stopped and we were all packed up and ready to say goodbye to our intrepid host, Mindia (who we realized had vacated his own room for us and slept on the porch couch! ), it was already 08h00 and cutting it very fine for what promised to be at least a 12 hour day. The first 10 kilometers were rough but rideable and we were proceeding well until we turned off onto a narrow, muddy hiking path which headed straight up. 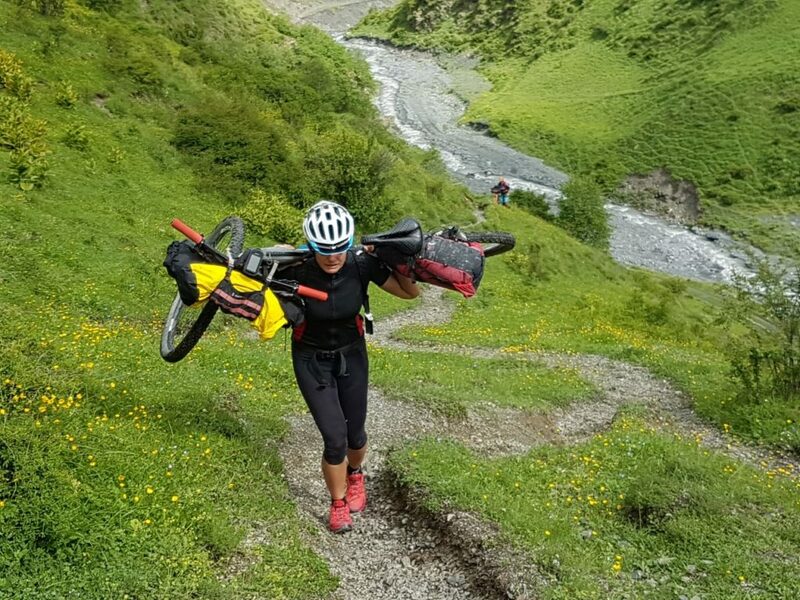 I, with my Freedom Challenge experience, quickly shouldered the bike and made rapid progress over Kati and Steve, who were pushing. Kati soon realized my method was a lot quicker, so with help from Steve, she too hoisted the bike and was well on her way. Steve, on the other hand lagged waaaaay behind. After waiting for ages with no sign of him, I left my bike and went back to check if he was ok and see if I could help. “I’m going back” he announced. ” This is madness. You and Kati go on” . ” No way!” I countered ” we not splitting up. We’ve come this far. I’ll help you”. With reluctance he conceded and hauled out a rope. (Turns out his bike is heavy as hell and his bags are loaded with God-knows-what!!! It was impossible for either of us to shoulder). So we went for 2.5 hours until we reached the small customs hut at the top of the hill. 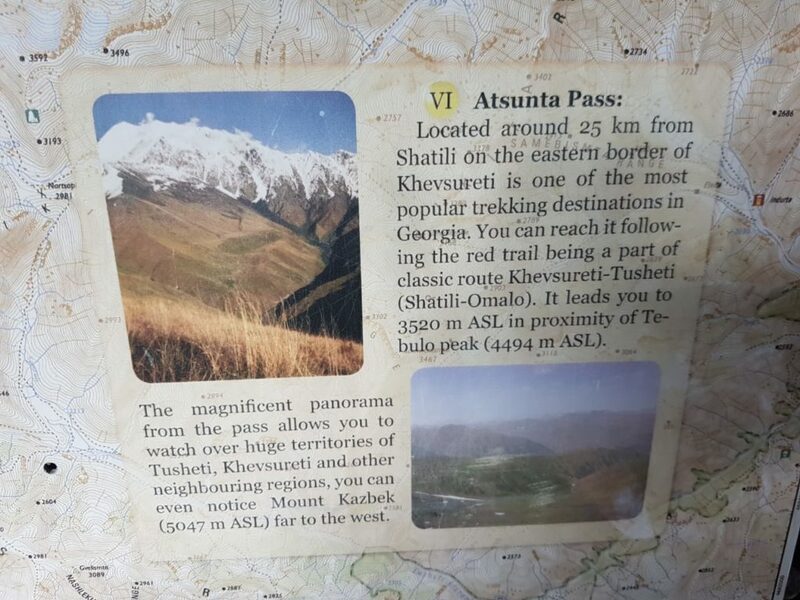 This is situated very close to the border with Chechnya and though you do not cross the actual border, you have to get a special permit to hike into this area of the high Caucasus. We duly handed over our passports and proceeded to change into our warmer and wet weather gear as we prepared to head even higher into the clouds. Finally on a narrow single track, we were able to ride for a while, but the sides of the track were very high and the drop off down the mountain was steep and the pedals kept banging. In a flash I misjudged, clipped the outer edge and fell over the slope and there I lay balancing on one arm and still clipped into my pedals, unable to move and feeling the chain rings digging deeper and deeper into my heel. My “HEEEEELLLPPP! !” had Steve suddenly moving at pace as he rushed forward to haul me back – the pain was excruciating, but I felt instinctively that it was a flesh wound and nothing was broken – ” just give me a moment to get past the pain” I said, while Steve urged me to be cautious, sensing his salvation may be close at hand…but alas, once the initial pain wore off I ascertained that I was able to walk and on we plodded and plodded and plodded. 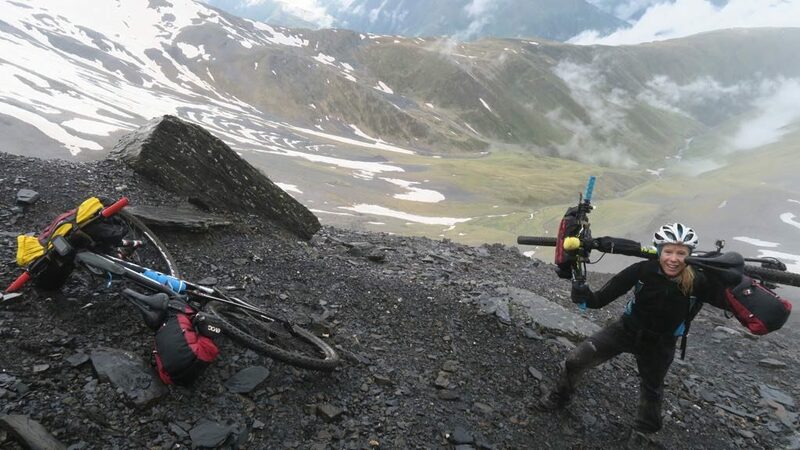 Steve and I switched bikes until I was no longer able to manage his heavy beast and then we reverted to the shouldering, pulling/ pushing method – I can’t begin to explain the exhaustion and we just kept climbing and climbing and climbing over thick, loose, shale and crossing slippery snow drifts and the end point seemed impossibly far away – what on earth were we doing? We should have listened to Steve!! But I kept chanting ” slowly, slowly eat an elephant” and indeed the beacon at the top came closer and closer one excruciatingly slow step at a time and amidst all the pain, the MOST unbelievable beauty all around. We could have taken some shale and painstaking dug a route through the snow, but we were fast runnig out of daylight and also had no idea what further obstacles might await on the other side of the summit. Sense FINALLY prevailed and we made the difficult decision to turn around and head all the way back!! 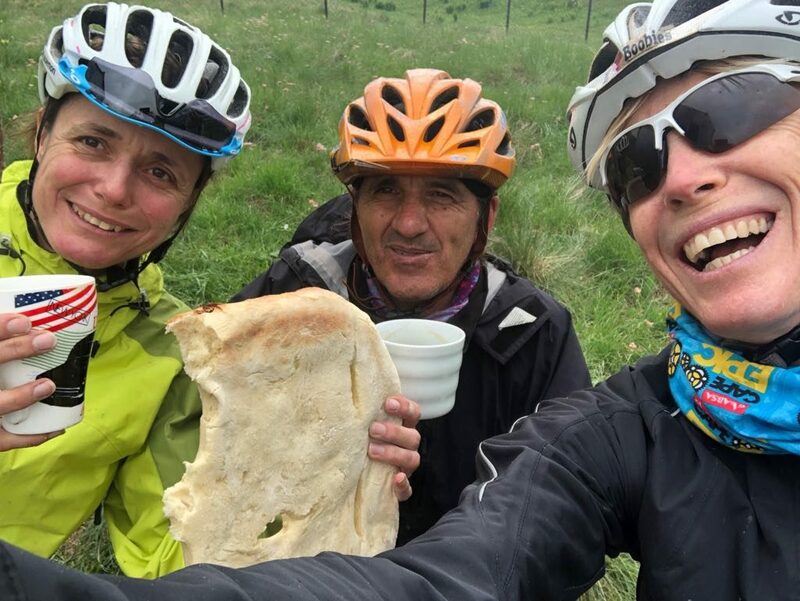 It was hard to maintain energy and motivation in the face of our disappointment and impossible not to debate the “what ifs and if onlys”, but such is Life and there was much pregnant silence on the long slog back. The dog at the customs post went ballistic as we descended to the hut and the guards all came out amazed to see us again. After lots if hand signals and garbled explanations we said ” Nagwamdis 2″ ( goodbye for the second time) and proceeded to slip and slide our way back down the now even more muddy slope in the pitch dark back to the river and a dodgy bridge crossing by flashlight, back to the home of Mindia. At 11 PM, a whole 15 hours later we knocked with trepidation on his bedroom window and stood sheepishly outside as he emerged, surprised and sleepy-eyed and welcomed us back. We said we’d sleep on the porch, but he insisted on us taking the room and not only that, but we showered in his newly plumbed hot shower and he gave us a dinner of soup and gatshapuri (cheesy bread) and 3 shots of vodka before we passed clean out in total and absolute exhaustion – what an adventure! It will always be remembered as our Atsunta insanity!! !